Growing up in the midwest, apple picking was a popular fall activity. Southern California does not quite have the same apple picking appeal, but in an effort to make it feel a little like home, I like to travel to Julian, CA, and visit their apple orchards. Julian is a cute, little mountain town that is known for their apples. Some great cider comes out of there if you’re a fan… California is experiencing a severe drought right now, so there were only two orchards open this year. We made the best of it and were able to come back with a bag of (fairly small) apples. There’s no way we can eat all of the apples before they go bad without cooking them, so I used some of our haul to make a healthy breakfast muffin. 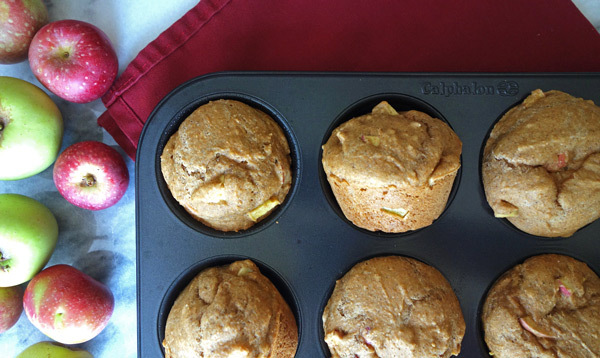 These less guilt muffins are quick to throw together and you get apple in every bite. An apple muffin a day keeps the doctor away. Preheat the oven to 350. Remember when you learned how to make buttermilk? You’re going to do it again for these muffins. Mix the vinegar with the milk in a measuring cup and set it aside for 5 minutes. You’re a pro at this by now. Chop the apples into somewhat small pieces. If you want bigger apple pieces in your muffins, I’m not going to stop you. Cut them whatever size you want. Measure the apple sauce. In a large bowl, mix the apple sauce, egg, vanilla, melted butter, milk, and brown sugar. In a medium bowl, mix the flours, baking soda, baking powder, and spices. If you want to save yourself a bowl, you can add the dry ingredients directly into the wet ingredients. However, I recommend limiting the stirring so you don’t make the muffins too dense. Stir in the diced apples. Bake the muffins until the tops rise and edges begin to brown slightly. Serve the muffins warm, but they’ll keep for a few days. Make buttermilk by mixing vinegar with milk in measuring cup. Let sit for 5 minutes. Chop apples and set aside. In large bowl, whisk apple sauce, egg, vanilla, milk, melted butter, and brown sugar. In a separate medium bowl, mix flours, baking soda, baking powder, and spices. Stir flour mixture into large bowl, stirring until combined. Fold in apples until combined. Lightly grease muffin tin with coconut oil spray or nonstick cooking spray (can use liners if preferred). These were absolutely delicious! Not to mention the fact that they are healthy is a bonus!